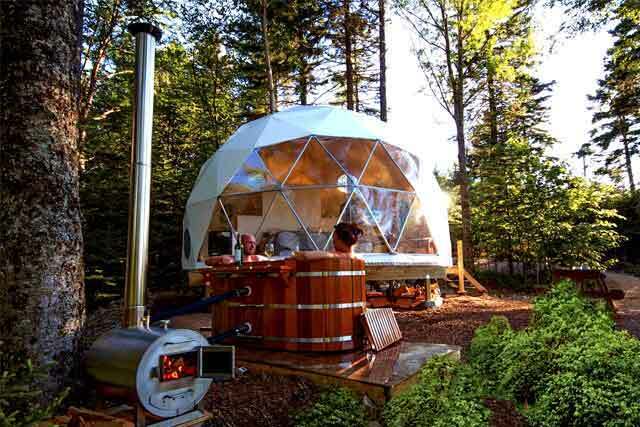 Pacific Dome of Oregon, leading builder of Geodesic Shelters for use as Emergency Dome Tents, Portable Emergency Shelters and Prefabricated Shelters as Emergency Food Distribution Tents, Portable Health Clinics and Geodesic Shelters for temporary housing. In August, 2005, Hurricane Katrina devastated the city of Biloxi, Mississippi, destroying homes and displacing thousands of residents. Pacific Domes felt an intense need to help, and within days we arrived at the outskirts of Biloxi with a convoy of relief domes along with food and medical supplies provided by the Ashland community. We set up base camp at the Van Duc Buddhist Monastery, where our pediatrician contact and a crew of teenagers were busy cleaning up wrecked cars and debris from the grounds. The entire town of Biloxi was virtually without power, so we brought in six generators capable of powering our operation. Our team worked hard to install a 44’ relief dome, a “relief supermarket” of sorts capable of distributing 15,000 pounds of food and supplies to roughly 500 families daily.